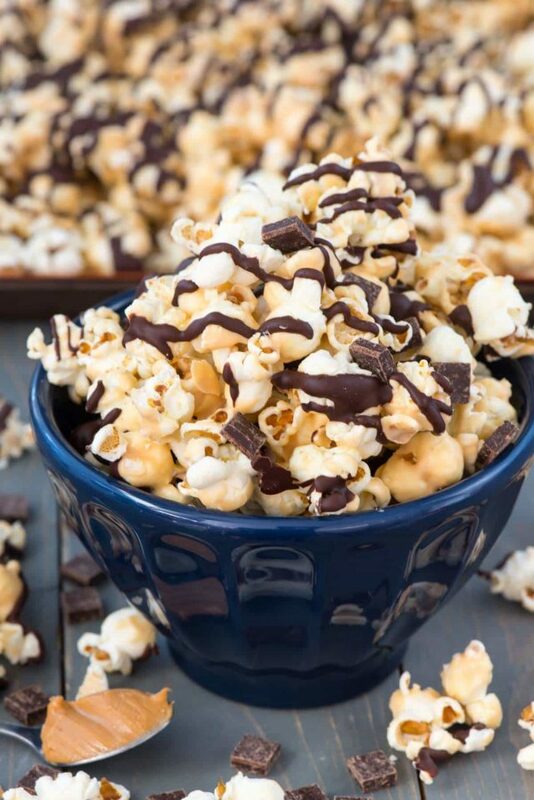 Chocolate Peanut Butter Popcorn is an easy 4 ingredient popcorn recipe that’s the perfect dessert or movie night snack. Plus, it’s great for gifting at the holidays; it packages up easily and is made in under 20 minutes! 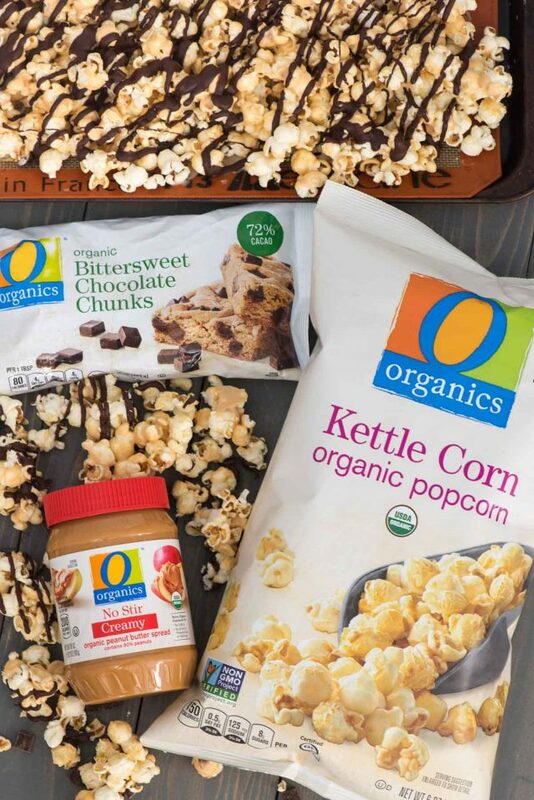 Thanks to the help of Safeway and their O Organics® line of products, I’m bringing you this popcorn recipe that will be perfect for your holiday needs this year. I have a weakness for popcorn…and for peanut butter…and for chocolate. Basically, this entire recipe is a huge test to my willpower every time I make it. And believe me, I make it a lot. It’s only 4 ingredients and comes together in under 20 minutes? How could I not make it all the time? I went through a phase where I was making popcorn on the blog often, but I haven’t made it recently. One of the things I love about dressing up popcorn is that you can do it so many ways. It’s kind of like making candy bark or fudge in that way: you can easily change up the ingredients to make it how you want. Not only do I make this popcorn recipe for just normal Friday night movie nights, but I love love love making it for the holidays. I’m always looking for a great gift that’s give-able and easily packable, and one that doesn’t go bad in just a day or so. This popcorn fits the bill! Plus, the recipe makes a ton so watch out friends, you’re all getting popcorn this year…unless I eat it first. If you get my weekly email newsletter, you’ll know that I attended an event in Pleasanton, CA a few weeks ago. That event was for Safeway, a grocery store I frequent. While I was there I got to taste several of their O Organics and Open Nature® products, which are completely top notch. I’m not unfamiliar with these products (I’ve even worked with them before) and because Safeway is my grocery store of choice I often have one of the two brands in my house at all times. Do any of you have any local grocery stores where you feel like the people know you? In a large town like I live in, that’s pretty rare, but with Safeway I always feel like I’m seeing old friends whenever I shop. The checkers are always the same and we talk about our dogs or products we like. The manager at my store has a son who goes to school with Jordan, so I see him around outside of the store too; it’s like one big community. One of the things I’m super excited about kind of takes me away from that community, but I’m okay with that because it helps my busy schedule: grocery delivery. In my area, Safeway grocery delivery is available. I’ve used it several times now and it’s a lifesaver, especially when life gets busy and I know I’m not going to get to the store. Here’s how it works: I order my groceries online via the Safeway Home Delivery website. They shop for me, picking out the best produce and all the items I’ve asked for, then the load the groceries onto refrigerated trucks. Everything is kept cold or frozen right until it’s delivered to my house within a time window I select. This service was a life saver a few weeks ago: I’d been gone 3 times in 2 weeks and my husband was in Europe on business. Between school and the dog and work I did not have time to grocery shop! I highly recommend you check out your store website and see if they have delivery in your area! When I was in Pleasanton I got to try the O Organics Bittersweet Chocolate Chunks. You guys – they’re AMAZING. The chocolate flavor is so deep and rich that I’m happy just having a handful for dessert and they satisfy my chocolate craving. I was also excited to find that their O Organics peanut butter now comes in a “No Stir” version. I love their traditional organic peanut butter but no stir is much better in cooking and baking because the oil doesn’t separate. I always forget that peanut butter isn’t just peanut butter because brand does matter; when I opened that jar the smell of real peanuts was so fragrant I had to go have my husband smell it too. Chocolate Peanut Butter Popcorn is an easy and fast recipe with just 4 ingredients, perfect for the holidays. That cute little boot is actually a debi lilly design™ vase that I got at Safeway in the floral section. It makes a cute popcorn holder too! I’m planning to buy a bunch of the little vases and fill them with popcorn for all of Jordan’s teachers this year. Whoever you give it to (or even if you choose to eat it all like I almost did) you must try this popcorn recipe. And be sure to check out your local Safeway or other Albertson’s Companies store and see all the exclusive products they have to offer. There are too many to list in this blog post! You can use Kettle Corn or any kind of popcorn you like. O Organics also has a Sea Salt and Olive Oil flavor that’s delicious. You can substitute crunchy for creamy peanut butter. I love using the Ghiradelli white chocolate melts that you can find in the baking aisle. They taste so much better and melt so much easier than white chocolate chips. If you have trouble melting either of your chocolates, add 1 teaspoon of coconut oil or vegetable oil. The oil helps it melt smoother, and drizzle easier too. Want to dress this up even more? Add chopped candy or nuts, or even some Christmas sprinkles or candy to make it more festive. 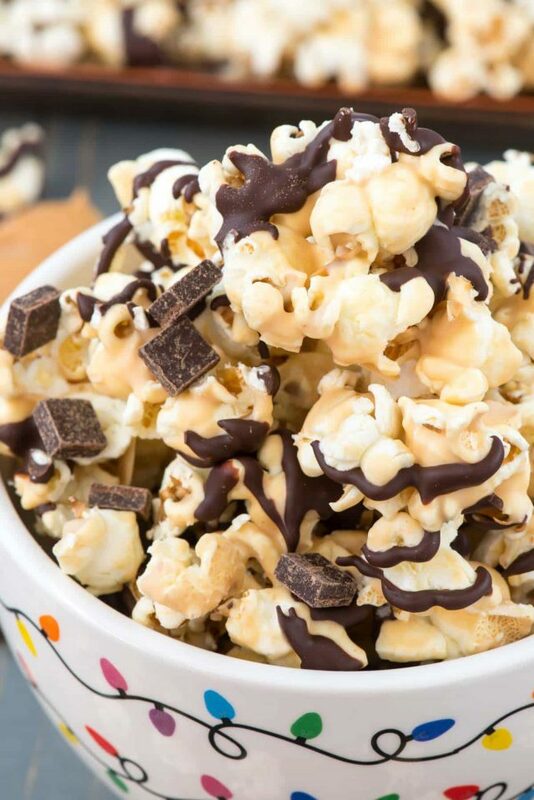 Chocolate Peanut Butter Popcorn is an easy 4 ingredient popcorn recipe that is perfect for dessert or movie night. It's also the perfect easy treat to make for gift giving at the holidays. Spread Kettle Corn on a baking sheet covered with parchment paper or a silicone baking mat. Melt vanilla melting wafers with peanut butter in a microwave safe bowl on 50% power for about 2-3 minutes, stirring every 30 seconds, until melted and smooth. Pour over popcorn on cookie sheet. Toss with your hands to coat. Melt chocolate chunks in a microwave safe bowl in 30 second increments, stirring between each, until melted and smooth, about 1-2 minutes. Place in a sandwich bag with the tip cut off and drizzle over popcorn. Chill the popcorn to harden, then break it apart and serve. Store in an airtight container in the refrigerator for up to one week. O Organics and debi lilly design™ products available exclusively at Safeway and Albertsons Companies family of stores. 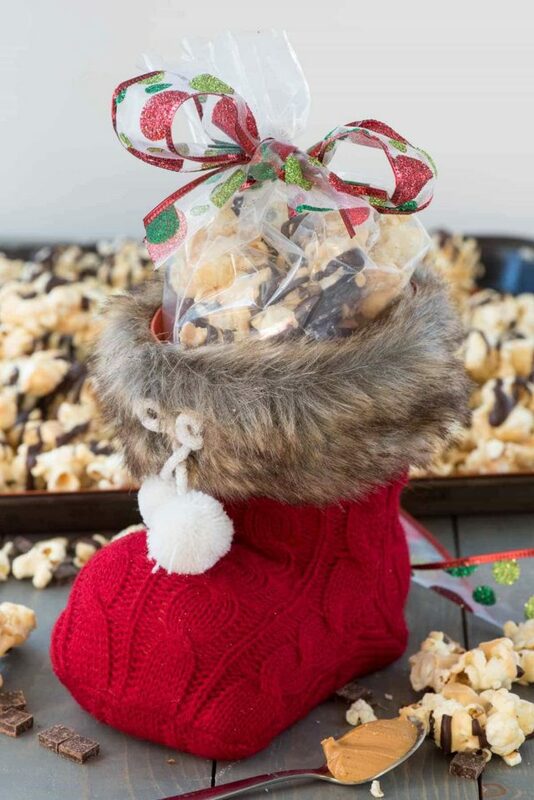 Be sure to check out all my popcorn or peanut butter recipes for even more holiday gifting ideas! This post has been sponsored by Safeway, an Albertson’s Company. All opinions are 100% my own. I would inhale this during an episode of RHW’s or some other Bravo show and wash it down with champagne. Not even kidding lol. Yum; I wish I had some right now. This would be a great gift to receive. This sounds good. I am putting it on my to make list. Thank you for the great gift idea. I will come back and tell you how it turns out. This is going to start out not seeming like a compliment but stay with me. In general, popcorn as a snack bores me. It’s not substantial enough. HOWEVER, when I opened this page I was like “wait. PEANUT BUTTER?” and I was like “OK I’m with you”. And then the chocolate. 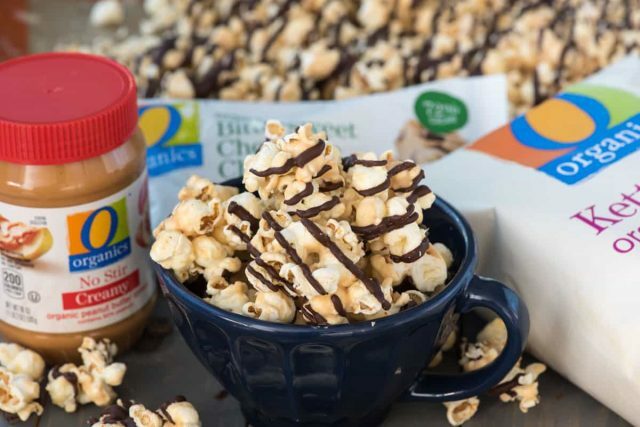 I’m imagining the richness and satiety that PB can offer with the crunchy popcorn and a chocolate drizzle and all of a sudden I’m no longer bored with popcorn. hey girl- this popcorn looks amazing! ah I love how simple this recipe is–and it looks SO addictive!